Even as state funding wilts, support for school gardens is growing. A freckle-faced Malloy Sparling wraps her dirt-dusted fingers around a three-pronged cultivator and looks up with a big-toothed smile. "We're making a garden," she says, plucking a weed out of the ground, then wiping her little hands on her tomato red T-shirt. Sparling and other young volunteers, plus parents and politicians, are taking part in a community work day at Farragut Elementary School in Culver City. But they're not the only ones spending this summer working toward a greener fall semester. Tools for getting started on school. While most schools sit like dormant ghost towns during the summer, a few are breaking up the asphalt, planting seeds that will be sprouting edible gardens come September. It may seem counterintuitive to start new programs in this economic climate. 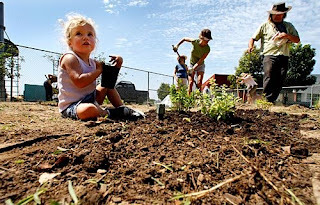 Summer school was canceled at many campuses this year, the $1.7-million California Instructional School Garden Program grant to the Los Angeles Unified School District has expired, and the budget crisis has left countless teachers unemployed. But this groundswell, largely sparked by parent and community interest -- and perhaps some inspiration from Michelle Obama's White House garden -- is finding support in all the right places. Ben Ford, chef-owner of Ford's Filling Station, and Akasha Richmond, chef-owner of Akasha, both restaurants in Culver City, spearheaded the recent work day at Farragut where parents, grandparents, children, chefs and politicians worked to lay the ground for a green space for students. There have been gardens on the Culver City campus for more than 50 years, which have gone through several cycles of productivity and abandonment, but Ford and Richmond are using their connections in the food industry to help make this plan as sustainable and financially painless as possible. They've secured soil, seed and supplies from local farms and nurseries, and food and refreshments for the volunteers from several local restaurants. In total, the two have spent only about $200 on the garden thus far. The organizers at Farragut hope they'll soon be able to tap Alice Waters for an Edible Schoolyard (ESY) certification, which will bring not only publicity but a seasoned veteran's perspective. Waters' ESY program is known for her implementation of seed-to-table gardens within the Berkeley school district, and has recently gone national, helping schools throughout the country execute curriculum-based gardens and locally sourced school lunch programs. In addition to her campus in New Orleans, Waters is working with the Larchmont Charter Schools in Hollywood, which have two fully functional gardens and a lunch program where meals are prepared with organic, local ingredients by an in-house chef. Waters says there is a shift in priorities that needs to happen within federal policy to give garden programs longevity. In the 1960s, John F. Kennedy implemented the President's Council on Physical Fitness to instill values of physical fitness. She considers the current prevalence of childhood obesity and early-onset Type 2 diabetes to be signals for immediate action similar to the fitness council. "Now we need a curriculum that's about ecology and about gastronomy so that we can make sure that children are making the right kinds of decisions for themselves, and for the planet. There's no way to address the issues of obesity unless you let children come into a relationship of food that's positive, restorative and desirable," Waters says. Carlos Lopez, a graduate of the garden program at Crenshaw High School, thinks a garden's value extends beyond promoting good health. "This is a way of giving kids a sense of ownership, a place to stay off the street. It saved me, and it saved a whole bunch of us. It can become so much bigger than just a garden." Lopez was part of the team that created Food From the Hood, a student-run business that sprouted from selling Crenshaw High's produce at local farmers markets and eventually expanded to create a national brand of salad dressing that was distributed at more than 2,000 locations. But since the students from Food From the Hood graduated, the garden has become overgrown and left unattended. A teaching garden. This summer, the Garden School Foundation, led by master gardener Nat Zappia, hopes to change that. On the first garden cleanup day, dozens of community members, former students from Food From the Hood, teachers and volunteers from Starbucks showed up to re-till soil, planting the seed for the soon-to-be student gardeners returning in the fall. Bill Vanderberg, dean of students at Crenshaw High, plans to use the garden as a vehicle for learning within the newly created Smaller Learning Communities (SLCs). He hopes the Business SLC will be able to model off the Garden School Foundation's 24th Street School garden, where the fifth-grade children have struck a deal with Pitfire Pizza Co. to trade their herbs for pizza. But the possibilities for educational incorporation don't stop there -- science, botany, social studies, history, geography, art and nutrition have all been included in existing local programs. Zappia hopes to use his background in history to introduce garden beds that are shaped like continents, where classes of students will learn about the history and culture of other nations through food. Mud Baron, gardening guru for LAUSD and caretaker of the North Hollywood High School farm, says that special-needs teachers often come to him for seedlings. "There's no such thing as a special ed sunflower. It's just a sunflower," he says. His 7-acre North Hollywood High School farm serves as a nursery for the rest of LAUSD -- it hosts a small Chardonnay vineyard, a greenhouse, a plethora of dahlias, several chickens and a pig named Francine. Baron also oversees the remaining 500-some-odd gardens across the LAUSD, which are at varying levels of production. This summer, he'll be working with students from the Summer Jobs Program who will be cultivating 500 Green Zebra tomatoes for Mary Sue Milliken and Susan Feniger, chef-owners of Ciudad and Border Grill. But even with his infectious enthusiasm, Baron's job is constantly at risk. Though California Instructional School Gardens Program grant funds are no longer available, LAUSD Superintendent Ramon Cortines has agreed to match the funds that Baron and the LAUSD School Garden Program raise, given that they reach $100,000. Donations can be made at www.laschoolgardens.com, which will go live at the end of this week. Community support may be the only way for school garden programs to survive. Friends of the earth. It appears that Angelenos from all walks of life are interested in lending a hand to advance the school garden movement, regardless of tough times. The Environmental Media Assn. and Yes to Carrots have partnered with LAUSD to sponsor 10 new school garden projects, one of which will be at Saturn Elementary in L.A.. Actor Jake Gyllenhaal will be their mentor, and architect Rogerio Carvalheiro, who worked on the Getty Villa and Union Station, will work pro bono on the design. Once completed this fall, they hope to add a "scratch kitchen," where children will prepare the food they grow. Saturn's garden project was started by an enthused group of parents who call themselves the "Rings of Saturn." Through applying for grants, working with local politicians and school leaders, and fundraisers, they have put together a garden plan for Saturn that they hope will boost its public image. "To be successful, this needs to be viewed as integral. These are skills that kids used to learn at home. Today, that's not a reality," says Melissa Patrick, who is heading the Saturn project. "You can't expect a whole person if you don't educate the whole child," Baron says. "We don't strictly learn within four square walls."